Products will be shipped via UPS ground, Fedex ground or USPS Priority, whichever is the most economical. Shipping prices quoted are only for order within the continental U.S. Please contact us for rates outside of this area. Other shipping services or expedited shipping is also available at the buyer’s request and expense. We will also ship using your account if requested. Please contact us with your needs. 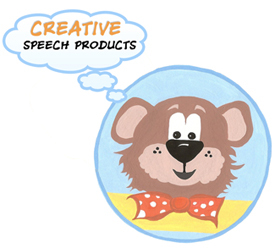 At Creative Speech Products, we value your business and take great pride in offering you creative, high quality teaching tools that appeal to children. If you have a question about returning a product, please contact us for information within 30 days of purchase. Depending on how you communicate with us, we collect and store various types of information (name, shipping address, billing address, phone number, email address, credit card information, etc.) necessary to complete a transaction. For example, we collect information you provide to us when you place an order, request an open account (to use a purchase order), send us an e-mail, or contact us by phone. The customer information we obtain will NEVER be sold or shared with any person(s) or parties in any way. When placing an order online, we protect your customer information in transit across the Internet with Secure Sockets Layer (SSL) using 128-bit encryption, which complies with Visa security requirements and is the highest level of encryption available in commercial web browsers. If you have any questions, or have concerns about purchasing online, please call us directly at 800.434.5371 between 8AM and 8PM EST or send an email to info@creativespeechproducts.com. It’s great to hear from you!